This device is famous for the sleek design of the model, brighter screen, and superb selfies. For India, the smartphone may be called Samsung SM-G610F. Over the specifications, the phone has the dimensions 151.8 x 77.5 x 8.2 mm (5.98 x 3.05 x 0.32 inch) and weighs about 172 grams (6.07 oz). The device is a dual-SIM handset and comes with a 4.8 inches ( about 70.9 screen-to-body ratio) full HD touchscreen with 16M colors. Also, the smartphone comes with a resolution of 1080 x 1920 pixels with a five finger support gestures. The phone runs on Android OS v6.0.1 Marshmallow. The device is powered by a 2.0 GHZ Qualcomm Snapdragon ( Exynos 7870 ) chipset and Quad-core 1.2 GHz Cortex-A53 CPU with Adreno 506 GPU. This model comes with 3 GB of RAM and 16 GB of internal memory which can be expandable up to 256 GB using a microSD card for which a dedicated slot is already present in the smartphone. 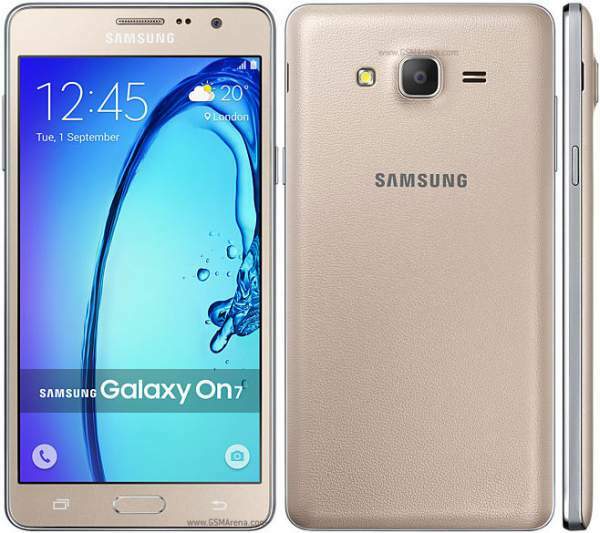 Galaxy On7 comes with a primary camera of 13-megapixels with an aperture of f/2.1, autofocus, and LED flash. The primary camera features Geo-tagging, touch focus and face detection. As the phone is also getting popularity because of the selfies, let me tell you that the device has a front camera of 8-megapixels with an aperture of f/2.2. The smartphone is powered by a non-removable Lithium-ion battery of 3,000 mAh which has a talk time of 21 hours (3G) and music play of about 78 hours. The battery may be of higher power also. This might be the first medium budget smartphone which will be providing fingerprint sensor in it. The phone comes with WiFi 802.11, Bluetooth v4.1, GPS, FM Radio and microUSB v2.0. The device comes with a 3.5 mm audio jack. The smartphone comes with Accelerometer and proximity sensor with it. The device supports GSM/ LTE/ HSPA network technologies. Being technical, the phone will be embedded in a motherboard of type universal7870 and processor ID ARM implementer 65 architecture 8 variant 0 part 3331 /Evision 4. These are the system information of the upcoming device as per a Benchmark website. The device might come in black and white color variants. Although there is not any official confirmation about the smartphone. This is the all the information from our sources. Hope the device launch with the same specifications soon in the country with an affordable price. It would prove to be a competitor for Moto G4 Plus and Lenovo’s Vibe P1. Previous articleAnil Kapoor’s 24 6th August 2016: Will Jai Live or Die?